On this day in history, 1994, the world’s first mass commercial internet spam campaign was launched when husband and wife immigration lawyer team, Laurence Canter and Martha Siegel, who had previously been subject to disciplinary action for unscrupulous practices (see Bonus Facts Below) and had been thrown out of the American Immigration Lawyers Association, used a Perl script to post a spam message to over 5,500 message boards on Usenet in about 90 minutes. The purpose of this mass spamming was to advertise the two’s services to help people fill out and submit appropriate forms to enter the “Green Card lottery”, a.k.a., the Diversity Immigrant Visa lottery. Aside from the mass spamming itself being somewhat exploitative, they also charged $95 (individual) or $145 (couple) for their services in helping people enter the lottery. While this may sound reasonable enough to have a lawyer fill out a form for you, it should be noted that at the time all one really needed to do to enter the lottery was to mail a postcard or letter with your name and address on it to the designated U.S. Department of State address within the time period they were accepting entries. Even today the process of entering the lottery is pretty straightforward (though once selected, that’s a whole different thing and legal council is sometimes advisable). All you have to do for the initial entry though is submit an electronic form (free) at the U.S. Department of State’s website when registration is open. Despite the ease in entering the lottery, many a spammer still attempts to rope people into paying money for the service of submitting them to this lottery. Modern Green Card spammers also tend to promise they can increase the chances of someone being selected in the lottery, which of course is impossible. Despite this ease, Canter and Siegel made a killing off this spamming, racking up an estimated $100,000-$200,000 as a result of it (according to them). This mass spamming didn’t go over very well with the Usenet users and tens of thousands of emails were sent the following day to Internet Direct, the two’s internet provider, complaining about it, which managed to crash Internet Direct’s mail servers several times throughout the next two days. Canter and Siegel had previously consulted with Internet Direct to make sure the company was fine with what they were going to do and that it could handle them posting to thousands of boards in rapid succession and the inevitable backlash that would result (both the emails from people wanting to hire Canter and Siegel and the negative emails complaining). Internet Direct said their system could handle it and so Canter and Siegel open an account and proceeded. However, due to the backlash, within days, Internet Direct terminated Canter and Siegel’s account, causing them to lose around 25,000-50,000 emails, some of which could have made the mass spamming even more profitable. As such, Siegel, along with the two other lawyers she brought with her, threatened to sue Internet Direct if they didn’t immediately reactivate the account, but Internet Direct refused. Canter and Siegel didn’t pursue an actual lawsuit against them. After this first volley, they launched another in June, “advertising” to around 1,000 newsgroups, which sparked the first “cancelbot” program, that would crawl Usenet and delete the spam messages automatically within a few minutes of being posted. As you might expect, Canter and Siegel were subsequently vilified in the court of public opinion, but none-the-less were audacious enough to start a business selling their services as “experts” in online marketing. Clients would then hire them to run mass spam campaigns for them. This made them not only the first mass-commercial internet spammers, but also the first to start a business that would perform mass commercial internet spamming for other businesses. They even wrote a book about how people could do this sort of thing themselves: How to Make a Fortune on the Information Superhighway : Everyone’s Guerrilla Guide to Marketing on the Internet and Other On-line Services and an updated version was written by Siegel (at this point divorced from Canter) in 1997 titled, How to Make a Fortune on the Internet. The same year Siegel published this updated version, Canter found himself being disbarred by the Supreme Court of Tennessee partially for his advertising practices. This is significant because it is the first time ever that a lawyer faced disciplinary action for disreputable advertising practices on the Internet. If only there were a comment thread on this ruling, one imagines Canter would have been the type to submit FIRST!!! This disbarring didn’t affect Canter much though as he had stopped practicing law two years previous and has since devoted himself to software development, such as writing stock tracking software and the like. Contrary to what is often said, this was not actually the first commercial network spam campaign, it was merely the first mass campaign. Canter and Siegel themselves had tested out their Green Card spamming previous to the mass posting, manually submitting to various Usenet groups to gauge response and the like. Further, there were numerous non-commercial spam posts submitted. One such spam message was submitted by Clarence Thomas IV, from Andrews University. His message, a “Global Alert for All: Jesus is Coming Soon”, was attempting to alert the world to the fact that the end was nigh. Even before this, there were other commercial postings and emails that could have been considered spam. The first such recorded commercial spam campaign on a packet switching network, on a much smaller scale than Canter and Siegel, was sent in 1978 by Gary Thuerk, via the ARPANET. This spam message was sent to a small group of 393 people and was advertising a new model of Digital Equipment Corporation computers. Going back even further, although through a significantly less sophisticated medium, commercial spam was commonly sent via the telegraphic network in the 19th century, particularly in the United States. Western Union allowed telegraphic messages on its network to be sent to multiple destinations; thus, wealthy American residents tended to get numerous spam messages through telegrams presenting unsolicited investment offers and the like. This wasn’t nearly as much of a problem in Europe due to the fact that telegraphy was regulated by post offices in Europe. And, of course, in between the telegraph and packet switching networks, we had and have telemarketers using the phone system for this same type of thing. Given the spamming track record, we can only brace ourselves for when the technology exists to communicate via projecting thoughts directly. When Canter and Siegel lived in Florida in 1987, the Supreme Court suspended them for 90 days for developing and implementing a “deliberate scheme to misrepresent facts”. About a year later, Canter resigned from the state bar in order to avoid additional charges of “neglect, misrepresentation, misappropriation of client funds and perjury.” At this point, the two moved to Arizona and took up a practice there. Joel Furr first mentioned “spam” (referring to junk messages) on Usenet on March 31, 1993, the first known instance of it being called such on Usenet. This is often incorrectly stated to be the first usage of the term spam as referring to junk messages anywhere. This first Usenet “spam” word case came when Richard Depew, who had been playing with some moderation software, accidentally ended up posting around 200 duplicate messages in a row to news.admin.policy newsgroup. Joel Furr then referred to this as spam. Depew himself when he apologized also referred to his messages as spam. 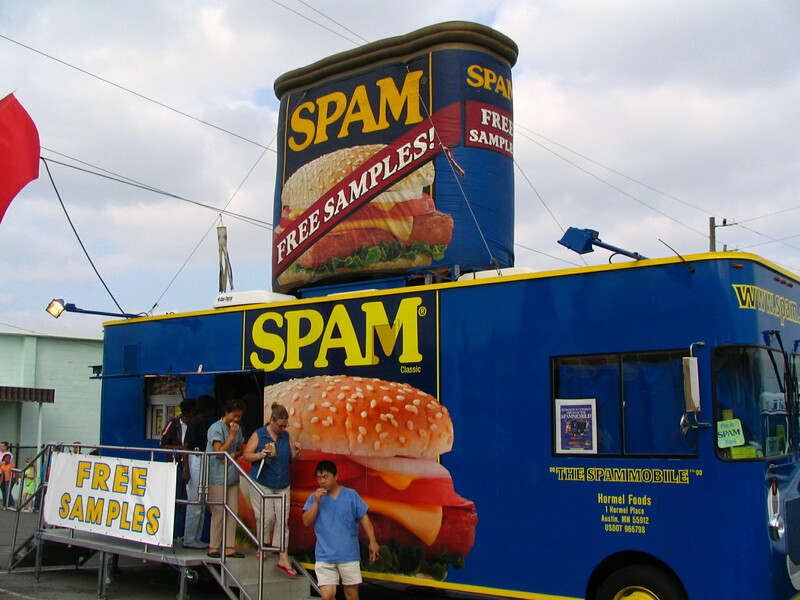 Austin, Minnesota is known as “SPAM town USA”, not for internet spam, but for the fact that the town produces all of the food product SPAM sold in North America, South America, and Australia. SPAM sold in the UK is produced in Denmark by the company Tulip, who Hormel has licenses its production out to. Hawaii and Guam both have McDonald’s restaurants that serve SPAM. Burger Kings in Hawaii also serve SPAM since 2007 to better compete with the McDonald’s there. SPAM is sometimes called “Hawaiian Steak” due to its extreme popularity there. Surprisingly, you have to go all the way down to number 91 on the list before you get to Nigeria. I suppose they only have so many rulers that can die and leave their fortune to us, so perhaps that explains the shortage of spam.